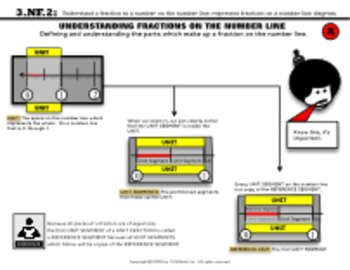 Common Core: Understanding a Fraction as a Number on the Number Line. 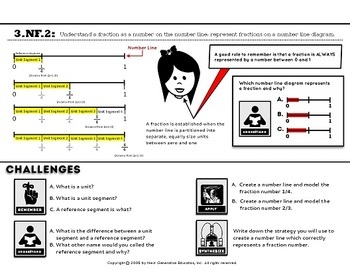 This exercise provides an in-depth introduction to Common Core standard 3.NF.2. 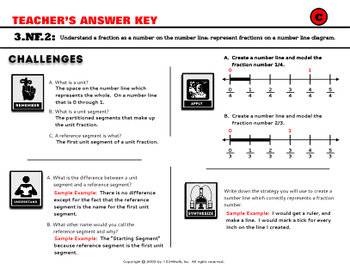 This packet focuses on the initial part of labeling and understanding the pieces which form a fraction on the number line. This exercise sprials students' proficiency using Bloom Taxonomy based questioning. Two avatar characters, Math4Life and Decinae provide tips and guidance to students as they learn. This exercise can be done by one student or teams of student, with focused assistance or without. Included are questions and answer key. This is my first posting, so I value any critiques which can help me improve my content for you.